It always pays to expect the unexpected. 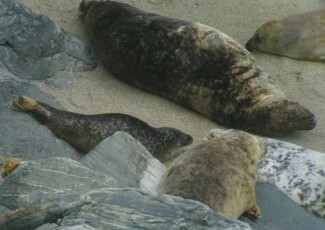 At the back of the haul out on the other side of the beach from us we noticed a small seal that looked a bit different. Looking through the binoculars in a howling gale isn’t easy and despite discussing the possibility of it being a common seal, we decided it was probably just the effect of the recent rain shower on its pelage. On our way back round the cliff top, we did however get a closer look and after much peering and deliberation we and realised as it turned around to face us that our initial impression had in fact been correct – this was a juvenile common seal! It was so lovely to see this young common seal relaxed and comfortable resting on the haul out beach surrounded by adult grey seals. When the common seal decided to adjust its position, it made the mistake of waking up an adjacent adult female, who retaliated with verbal grief. 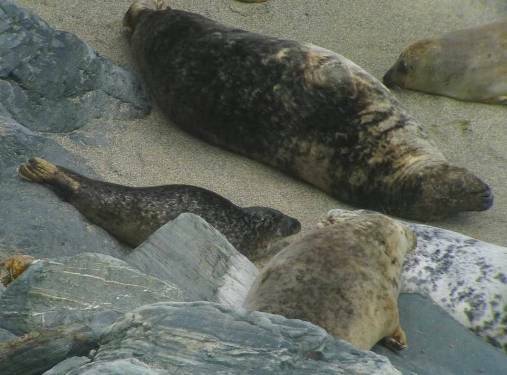 Undeterred however, the little common seal gave her the space she desired and promptly fell asleep right next to an enormous adult male. 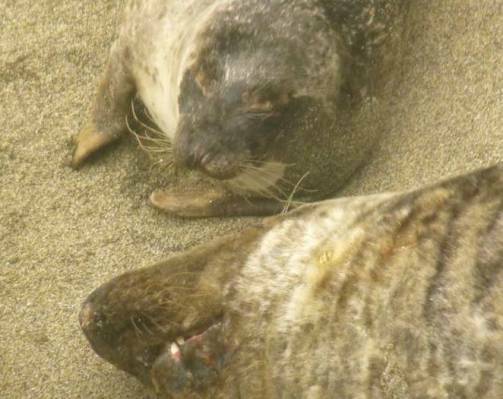 So how can you tell a common from a grey seal? Well for me it starts with the pelage pattern – it is speckled or mottled made of tiny dots or rings. Then it is the impression of the head, which is small with a short nose and obvious forehead. Then if the nostrils can be seen they have a slightly more triangular appearance compared to the more parallel nostrils of grey seals. 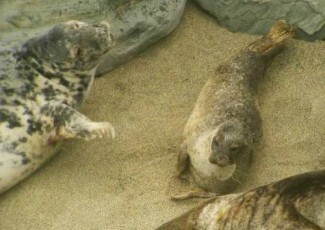 Finally of course, the size is important too as commons are smaller overall than grey seals. 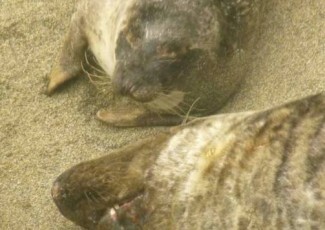 In summary, for me common seals look more like cats and grey seals more like labrador dogs. 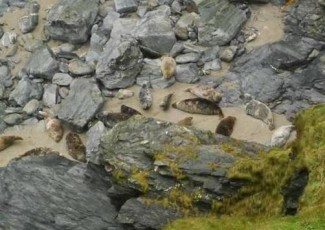 This is not the first time that a common seal has been seen here. My first was spotted in 2005 and others have been seen here since – in 2010 and 2011. 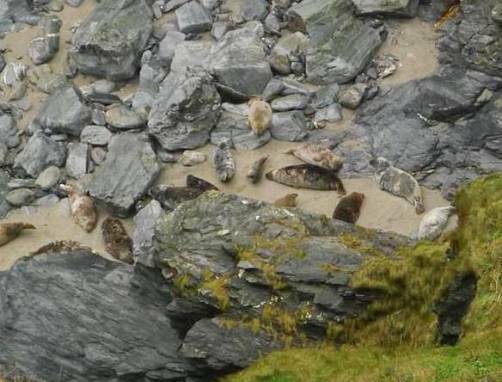 This all goes to show that whilst common seals are more common that greys globally, in Cornwall they are a much less frequent sight and as has happened before, I reluctantly heard myself saying…ahh, it’s so cute!